My name is Marina Pumani Brown, I am a 35-year-old Anangu woman. My family has lived around the present day location of Mimili Community on the APY lands of South Australia forever. My work captures a long line of cultural knowledge; knowledge that I am proud to be the custodian of, responsible for keeping it safe and passing it on to the next generation. Whilst my mother strictly paints Antara, a sacred ceremonial site close to Mimili, I have broadened my practice to include other knowledge that is important to me. This knowledge speaks of traditions that are very much part of our day-to-day life out here in Mimili, traditions that are eternally old but ever present. 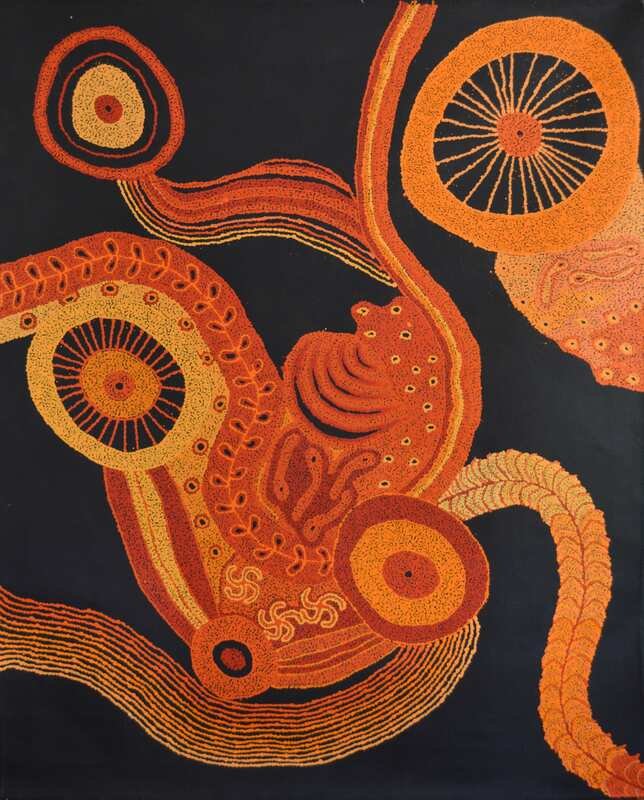 My paintings are about the Wanampi Tjukurpa (Water Snake Story) remnants of which can be seen in the rocks and hills around Mimili, of trips to the area around Antara and Victory Well, where we collect Mingkulpa (bush tobacco) and care for the local tjukula (rock holes). Particularly after kapi pulka (big rains), the land becomes so fertile, and we harvest bush foods like the gnurru (lollie tree) and camp out on country like the old people used to. My paintings are both literal maps of the landscape and objects of meaning that transcend any physical representation. Though not always depicted, the importance of Antara is never lost in my work. The site has been integral to the existence of Anangu culture since the beginning of time. Today my life is different to that of my ancestors and my work is a tool to document my part in a story that spreads across timespans bigger than our imagination.